The last decade has undoubtedly been difficult for the Zimbabwean economy. A myriad of political and economic measures have virtually brought it to a halt. The drought experienced in Southern Africa, capped by El Nino, is the worst in decades, affecting nearly 30 million people according to the United Nations. In Zimbabwe nearly five million people in the rural areas – nearly half the country’s population – are affected. In February 2016, Zimbabwe’s Vice President Emmerson Mnangagwa appealed to local business and charities for more than $1.5bn in aid to save more than a quarter of the population from starvation between February and December 2016. The lack of US dollars stands to affect the long-term growth of the economy, in particular mining which earns half of Zimbabwe’s export earnings. Traditionally the agricultural sector was the foreign currency earner for the country, however due to recurring droughts and unstable regulatory policies within the sector, mining has become the foreign exchange breadwinner. Though holding the largest reserves of platinum in the world after South Africa, being the 8th largest producer of diamonds in 2014 according to the Kimberley Process, and home to a range of other high demand resources, deflated international commodity prices have strained the sector. The lack of US dollars in the country is a great blow to an economy struggling to get back onto its feet. The crisis has hit banks, which are facing delays of between 10 – 20 working days in making necessary payments for the importation of mining equipment; such delays could affect production for up to four months. The delay in production spells reduced potential dollar reserves for the Reserve Bank of Zimbabwe, fundamentally undermining the efficiency of the entire economy, as the reserve bank has had to introduce US dollar quotas on both businesses and customers visiting banks. As a measure to stem the out flow of currency leaving the country, the Bankers Association of Zimbabwe has argued that the use of South African Rands – the country’s largest trading partner – is required. The introduction of the South African rand could stem the outflow of dollars however this would mean joining the Southern African Customs Union (SACU) and the Common Monetary Area, a complicated process that would require all stakeholders to agree. Rather than move decisively in this direction the Reserve Bank of Zimbabwe has decided to introduce local bond notes/coins officially by October this year. Although reportedly this is not a move to re-establish a new currency, the local bond notes are geared to boost exports and generate foreign exchange, with hope of reducing the deficit. A bond facility of $200 million has been underwritten by Afreximbank (Africa Export and Import Bank) for the Reserve Bank of Zimbabwe. The bond facility is primarily geared at exporters who will be given an export incentive subsidy based on the goods exported through the foreign exchange facility, between 2.5 and 5%. The value of the bond will be on equal par to that of the U.S dollar but would not have any value outside the country. The goal therefore is that exporters are paid in foreign currency into the Reserve bank of Zimbabwe nostro accounts and consequently paid out in bond notes, hopefully increasing export production and earnings for the export sector. As the government deals with foreign exchange shortages it aims to consolidate the diamond-mining sector, a key foreign exchange earner. There is uncertainty in the regulatory framework of the mining industry as the government aims to have a stake in all diamond mines in the country. The move is based on the purported lack of transparency of the mining companies in the country and lack of tax payment to the state. As some mining companies have decided against partnering with the government entity all but two mines were asked to halt production and vacate the premises. 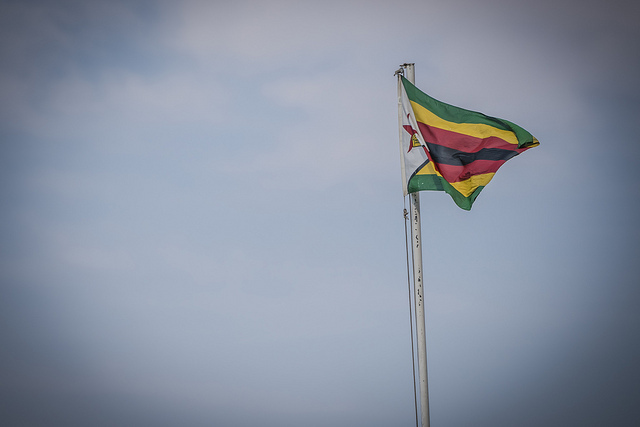 The uncertainty of the government’s position and foresight on matters relating to the mining industry, food security and monetary policy highlights the precarious nature of the economic position of Zimbabwe. Over the last near two decades the ruling ZANU-PF party has exhibited mis-governance. In the late 1990s the policies on agricultural reform crippled agricultural production. Most recently the diamond sector is known broadly to be opaque in relation to funding the ruling party rather than the state. Corruption is said to be endemic within the sector. Furthermore, the recent importation ban on a range of goods from South Africa to Zimbabwe caused riots at the Beitbridge border crossing into Zimbabwe. This ban stems from the US dollar shortage, itself a product of lack of export competitiveness, but was seemingly imposed without foresight that many traders make their sole earnings moving across the Zimbabwe-South Africa border. It is clear that the country has the necessary natural resources and knowledge to get back on track; however, without drawing a cohesive policy plan that links and acknowledges all sectors of the economy and populous, it’ll be increasingly difficult for the state to create the necessary environment for both business and citizenry to rebuild what a decade of political economic misfortune has wrought on the economy.